When you think about spotting scopes and other sporting optics, chances are you think about Swarovski Optik. Since 1895, the family of Daniel Swarovski has been synonymous with the clearest crystal, precision grinding, and a brilliant spirit of innovation in optics. As a result, Swarovski Optik has been known to produce the finest binoculars, riflescopes, and spotting scopes. Let’s take a look at some of the best options from this premier optics manufacturer, as well as what we’ve come to expect from the leader of the industry. 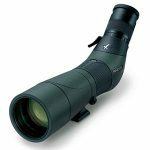 You won’t find a truly low-priced Swarovski spotting scope, but there is a model that’s a good entry point to this premium glass. The Swarovski HD ATS–65mm features a 65mm objective lens using BaK–4 prism glass and fluoride-containing HD lenses to minimize chromatic aberrations. The drawbacks to this variant include slightly “soft” images beyond 150 yards, a narrow field of view, and the need to purchase the eyepiece separately. Then again, the benefit of changing between a 20X to 60X eyepiece and a 25X to 50X model might outweigh the cost. My favorite Swarovski scope is the ATX/STX–95, a modular accessory that is capable of being attached to either a straight eyepiece or an angled one. This revolutionary glass is expensive, but the huge 95mm objective lens allows for amazing light gathering. It is constructed using apochromatic HD lenses with BaK–4 prism glass, and is capable of astounding detail resolution and up to 70X magnification. Eye relief is quite good at 20mm, but this model is quite heavy – 4.7 pounds. What Common Features Will I Find In Swarovski’s Glass? The most common characteristics of this company’s optics is the quality of the product. All Swarovski spotting scopes contain fully multicoated optics and are constructed of durable materials that will stand the test of time. Many models are camera-adaptable for digiscoping, and the higher-end pieces are so modular that you can even exchange eyepieces to have multiple spotting scopes in a single unit. On newer models, the zoom ring is located directly behind the focusing mechanism, making it easier to operate the glass one-handed. What Accessories Ship In The Box? Normally, you won’t find much in the packaging other than the spotting scope itself and a carrying case. Swarovski typically does not bundle tripods with its products, but it does provide soft carrying cases that are well-padded to protect your investment. You also may find a lens cleaning cloth in the box, but that’s about it. Quite frankly, the lack of a bundled tripod doesn’t bother me – most of those are junk, anyways. How Powerful Is The Magnification? Magnification depends solely on the eyepiece, but Swarovski produces terrific ones. You can have magnification ranging from 20X all the way up to 70X, depending on the model of spotting scope and eyepiece you select. The image, regardless of the zoom level, is crisp, clear, and has plenty of resolution and contrast. Thanks to the HD lenses, color reproduction is very precise without any chromatic aberration. Are Swarovski’s Spotting Scopes Easy To Operate? Exceedingly so. Even when the magnification ring is located behind the focus wheel, it’s easy to differentiate the two. The controls move smoothly, but with enough friction to keep you from moving them inadvertently. Focusing is a breeze, and both wheels always have enough stippling to make them easy to control even with slippery or gloved hands. Will I Easily Focus My Scope? Sharpness and quick focusing are hallmarks of Swarovski optics. You’ll be immensely pleased with how well these spotting scopes bring even the furthest objects into crystal clear focus. How Good Are The Optics On The Glass? As previously mentioned, Swarovski uses BaK–4 prism glass, in a traditional porro prism layout. Phase correction coatings are properly applied to eliminate phase shift, and the new SwaroClean coating on the lenses makes them much easier to clean than you might be used to. The only problem I’ve run into is a bit of softness in images beyond 150 yards with the ATS–65mm model, but I believe Swarovski has even addressed that on newer versions of the scope. What Does Swarovski Use For The Housings Of Its Spotting Scopes? On some models, Swarovski incorporates aluminum housings into its spotting scopes, while other variants are made from magnesium alloy for even more lightness. In all cases, rubberized armor is coated around the body to add shock resistance. On scopes fitted with a tripod ring, the mount rotates around the body of the glass to allow you to position your optic at a perfect viewing angle for your needs. Are These Models Useful For Astronomy? With generously-sized objective lenses and fully multicoated optics, Swarovski’s scopes excel in transmittance. The ATS, STS, ATX, and ATS models are all very useful for backyard astronomers, but the angled eyepiece versions will obviously be better suited to this purpose. The ATX–95, in fact, almost exceeds my telescope’s usefulness when it comes to viewing the surface of the moon, the International Space Station, and even the gas giants Jupiter and Saturn. Are These Durable Spotting Scopes? Every product Swarovski manufactures is quite durable, capable of lasting you for years. This is definitely a good thing, considering the amount of expense you’ll put into your investment. The optics chambers are always nitrogen-purged, and the lenses are sealed with O-rings. Not only are these scopes shock-proof from the rubber armor, but they’re also waterproof and fogproof. 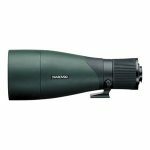 A Swarovski spotting scope carries a limited lifetime warranty on the optical system of its products, and all other components are warranteed for ten years from the date or purchase. Thanks for visiting and reading about Swarovski’s spotting scopes. These are definitely the crème de la crème of optics, and are outstanding investments. Nothing is perfect, but Swarovski comes as close to it as possible.